Virtually all carbon and aluminium bike manufacturers use something called a “rivnut” as a water bottle boss. A rivnut is like a combination of rivet and a nut, forming a threaded anchor in a thin-walled material. Over time, a rivnut threads can corrode or strip out. Or a bolt could seize within the rivnut and/or the rivnut’s grip in the tube wall could weaken, leaving the rivnut spinning in the frame. Sometimes the rivnut can be retightened, but often times replacement is the only cure. 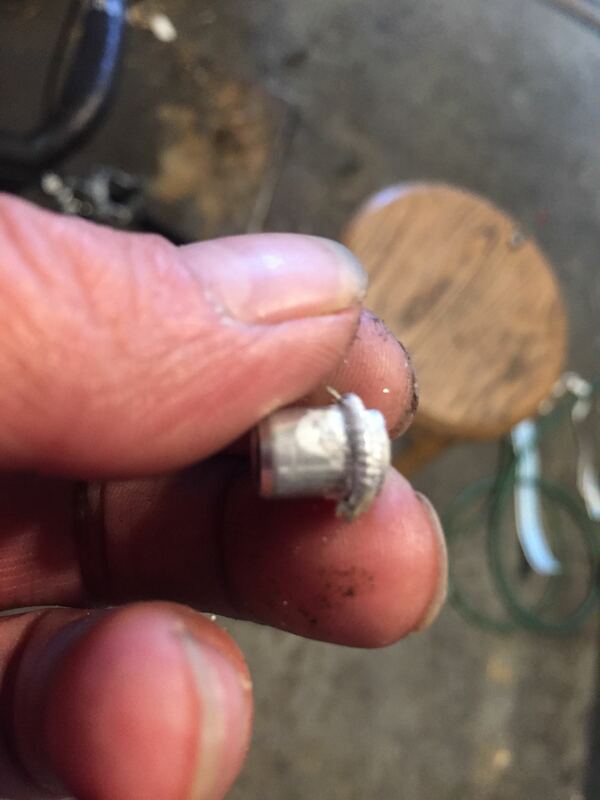 The basic tactic is to grind out the rivnut without damaging the surrounding tube wall and then replace it with a fresh, maybe stronger rivnut. First Dremel out the outer flange of the stripped rivnut. You might want to protect the surrounding area with a layer of electrical tape in case the tool slips. The goal is to remove the flange without touching the surrounding carbon. Once the flange is thin enough, you might be able to tear it off with pliers. Once the outer flange is removed, you should be able to lightly tap the rivnut so that it falls into the frame interior. 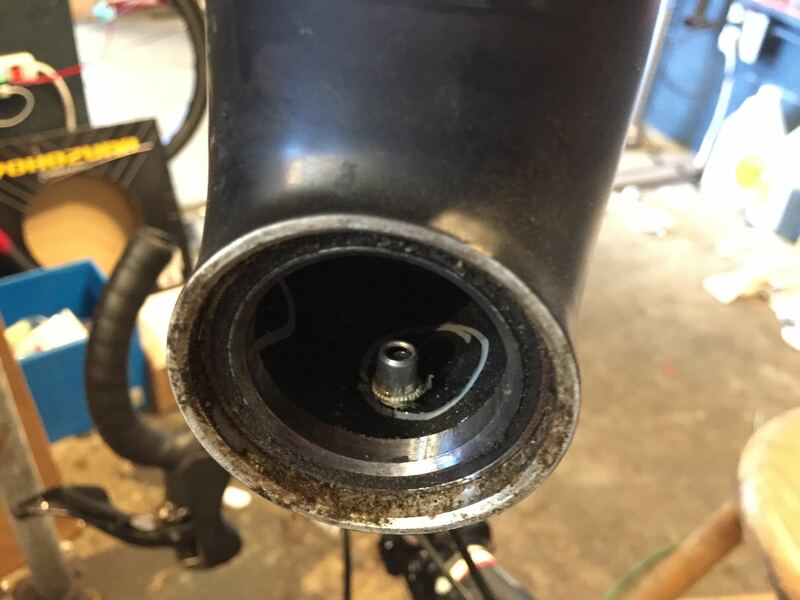 With luck, you should be able to shake the rivnut’s remains out of the frame through with the bottom bracket shell or the headtube. 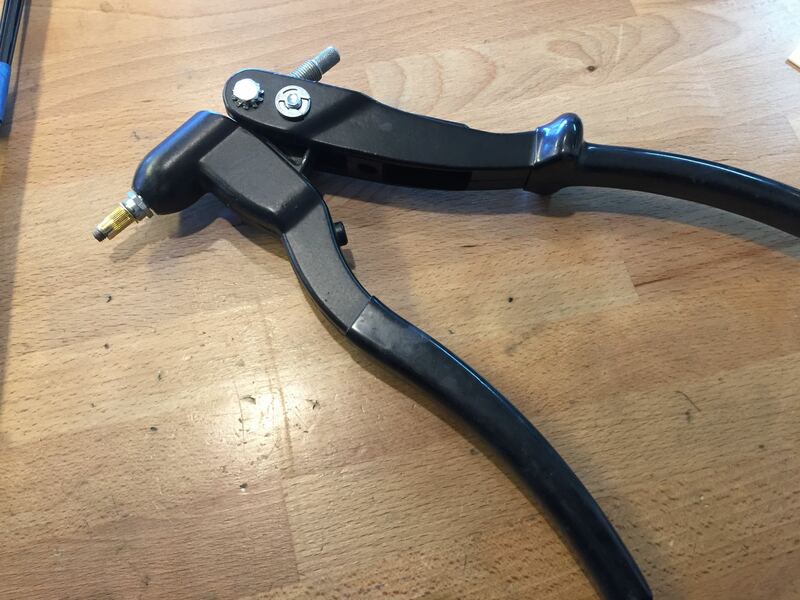 You can rig up a tool with a long 5mm bolt and a 6mm nut, but here’s the proper tool for the job. Most manufacturers use an aluminium nut, which is a relatively soft metal and vulnerable to galvanic corrosion (particularly in carbon frames). For repairs, I use a steel replacement. On the left, a rivnut in its original state. 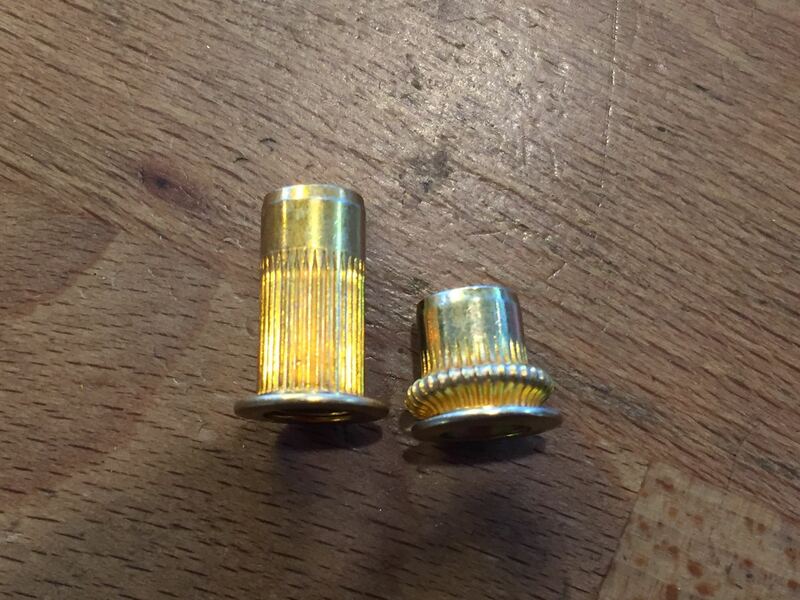 On the right, a rivnut that has been compressed. The corrugated wall crushes to form an interior flange. For extra security and to make up for any damage that might have occurred due to rivnut failure, I coat the replacement rivnut in epoxy before I install. Promptly use a shop rag dampened with denatured alcohol to remove the excess epoxy. The bottle boss is probably good to go immediately, but best results would come after the epoxy finishes curing in 24hrs. Use a well-greased stainless steel bolt to ward off future reoccurrences. One potential problem is if the you can’t shake the rivnut out of the frame interior. 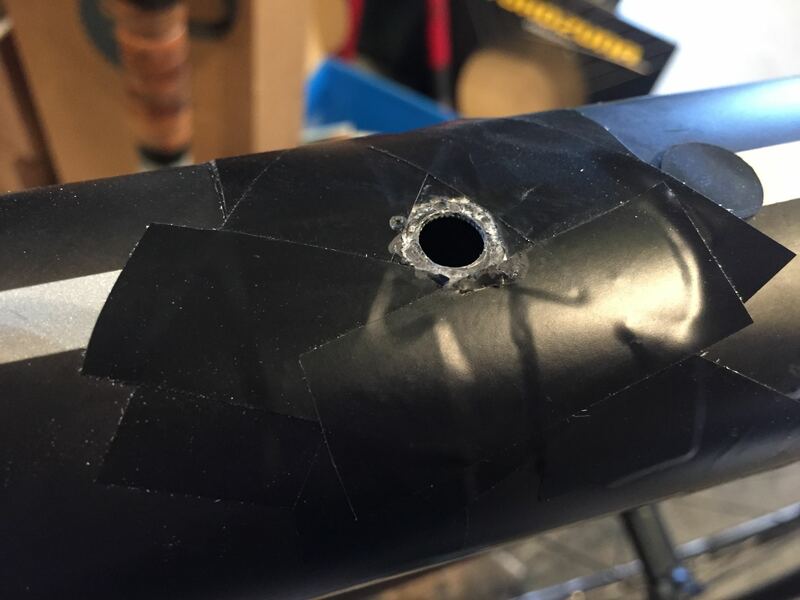 Most current monocoque frames (especially those with tapered fork steerers) have large openings at either the head tube and sometimes the bottom bracket shell. 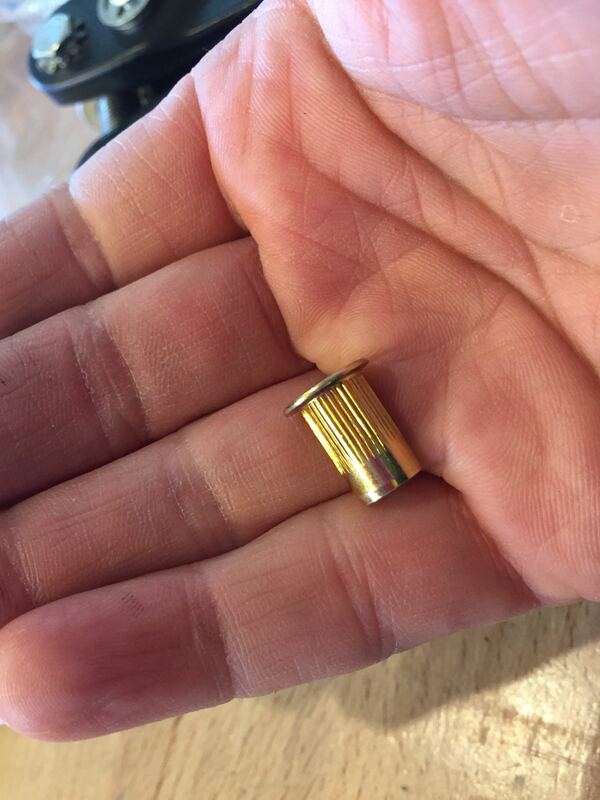 In a worse case scenario, you’ll have to find a way to make it so that the rivnut doesn’t rattle around like the last bean in the coffee can. You’ll need something super sticky. I suggest spray insulation foam, the kind you find at a hardware store to fill in spaces in old walls. You will only use a tiny fraction of the canister though. Conveniently the canister comes with a thin straw applicator. 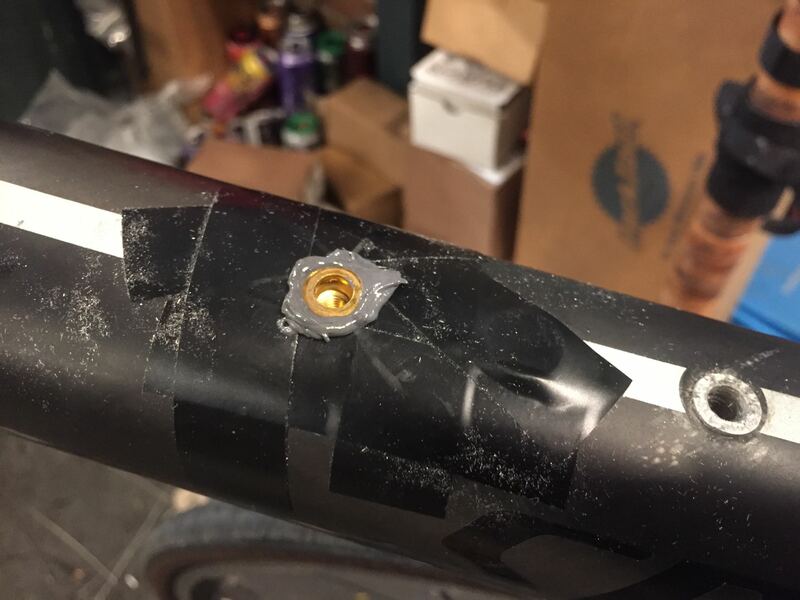 So you can snake the little tube into the hole in the frame that the rivnut once occupied, squirt a small dollop of foam inside near the bottom bracket, and then tilt the frame about until the rivnut hits the sticky goo. You will want to wait until the foam cures before riding, but it won’t be rattling loose ever. If the offending rivnut has a seized bolt in it (probably still loosely but unyieldingly shackling a bottle cage in place), you’ll have to deal with that as well. 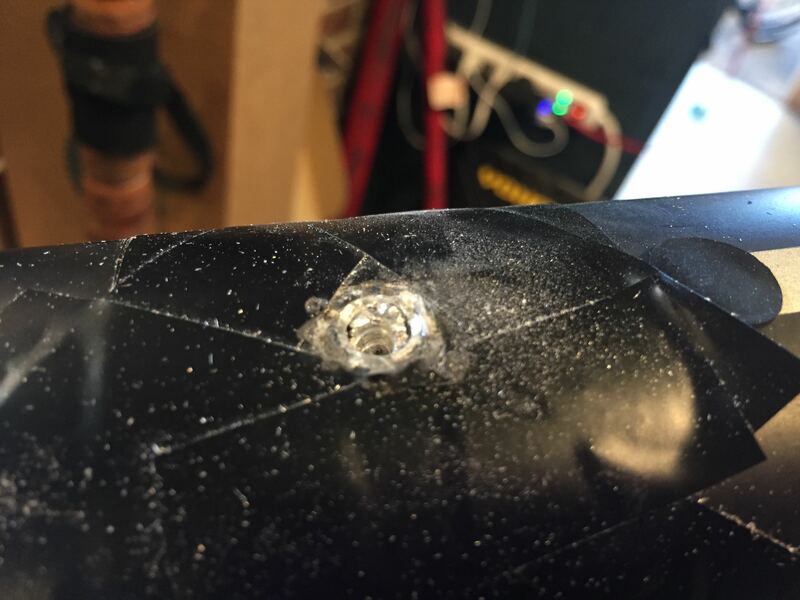 In that case, it helps to have a Dremel with a small cut-off wheel, but really anything goes…so long as you don’t put any undue stress on the carbon tube or have any stray tool strikes. I work for titanium framebuilders, whose frames use welded-in bosses and don’t suffer from this issue (though some Ti builders do use rivnuts). Whenever I am fixing this issue, I am rescuing some other brand’s bike. 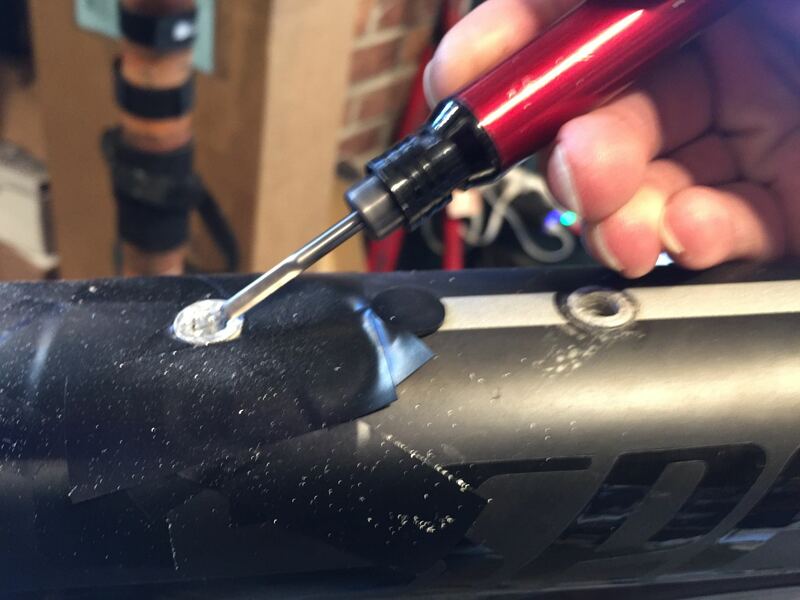 I have executed this fix on everything from Colnagos to Cannondales, Cervelos to Pinarellos….and more than a couple Litespeed titanium frames. So yes, I can and have done this many times. 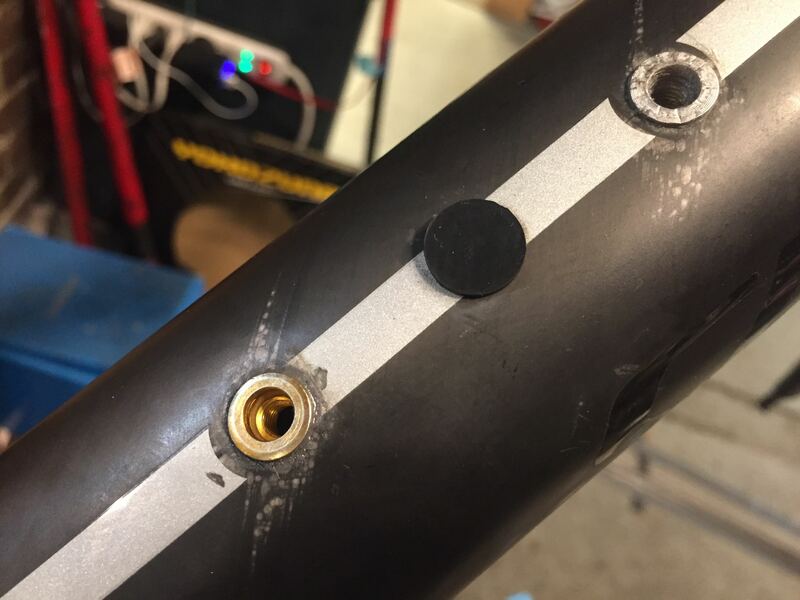 But I have to make it cost enough to justify the time I am not assembling our own custom bikes, and the fee has to be worth the risk responsibility I have to accept when working on your bling carbon bike. And NO, you cannot hang around and watch me as I work.